I activated several plugins: Notably..
– Mobile press to make viewing my blog on your phone that much more pleasurable. This plugin was created by the good folks at Younique, a social marketing company out of South Africa. @Tylerreed good stuff man. Mobile press works beautifully on Opera and Iphone. I would highly recommend it. Do let me know if you encounter any problem on other mobile browsers. – I am still trying to figure out how to use Zemanta to deal bring in ‘related’ links for posts. A wallpaper that my talented relative Jepchumba designed, click on this image to download it from flickr. Hilton Hotel Nairobi Under Construction 1968? 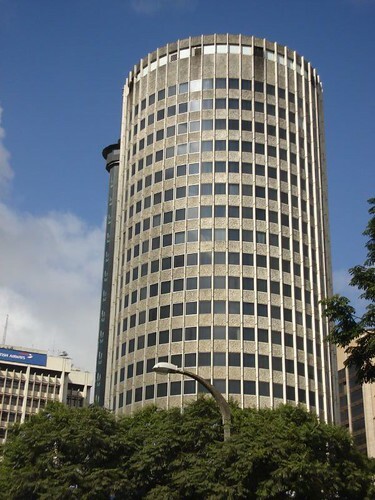 The first picture was originally uploaded by ART NAHPRO, and submitted to the Nairobi Architecture flickr group. The ‘after’ pic is one I took January 2007. Update: Here is another picture from January 18th 2008 – Gives you another view. You might notice the snazzy new design, and the realignment of things on my blog, I just completed the redirection of the RSS feeds on Feedburner, so please note the new RSS feed link. The old feed link should redirect to the new one, but in case it does not, please just re-subscribe. If you ever need to redirect feed links, check out this post for the short instructions. The theme of the blog is based on Firebug, it was customized and given the ‘Mweshi treatment’ by the talented designer Mulumba. I switched hosting companies from Locomotive Media, which was actually powered by wind, to Dreamhost. I racked my brain quite a bit about this, but the fact that Dreamhost offsets its carbon emissions made my decision easier. Granted I would prefer to use a data center that actually uses renewable energy like I did before, Dreamhost offers a very good deal and gobs of space for further growth. It is quite an honor for me that my blog is on the list of Top 45 Female African bloggers, I am so excited! The email Lester sent had a really cool picture that captures my excitement. Yay! to blogging, and here’s to a relaunch of Afromusing. Thanks for the honor AfriGator, and thanks to Mweshi for helping me switch hosts. Cheers! Screen shot from The Daily Show with Jon Stewart. 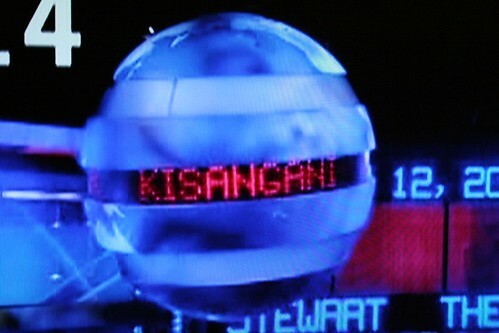 Noticed that the city ‘Kisangani’ in DRC (Democratic Republic of Congo) is displayed for afew seconds the spinning globe graphic at the beginning of the show. Is Kisangani a place in the coastal province of Kenya too? Shashank of ‘Somewhere in Nairobi’ tagged me in the meme that is ‘My week in Media’. Some of the longtime readers of this blog might know that I have a healthy appreciation, perhaps a sort of admiration of journalists around the world. Its probably because I just want a Thuraya Satellite phone like the ones they often carry with them. Shashank’s blog is one of my favorites, i remember laughing hard at the post God and Warlords’ – i.e comb through his archives. You can read the pieces that appear in McClatchy newspapers here. Sara Nics, who is a journalism trainer in Nairobi spoke with John Keating about the challenges of reporting on conflict. It gives you a glimpse on the situation the Kenyan media find themselves, the problem of media credibility the internal struggle with editors beholden to owners close to the politicians, and the changes in workplace interaction. I think Journalist-bloggers like Shashank, Rob Crilly, Sara Nics, Nick Wadhams, vigilante journalist etc, fill an important gap for Kenyan readers and bloggers who want the news straight up, and perhaps are not hamstrung by the current conflict, the way Kenyan journalists are. Reading the online editions of Nation media group and The Standard can be frustrating at times. They do not update their online editions as the news happens, and i often find myself checking BBC for latest information. By and large Kenya is a newspaper reading nation, but i do hope that one day we can also read more blogs by the noted Kenyan journalists to get their viewpoints and a glimpse ‘behind the scenes’ as they go about reporting. Boy did i digress…o.k on to the tag. The Best of Technology Writing 2007, edited by Steven Levy. Not much telly, though i try to catch the Daily show and The Boondocks. A repeat of Gorillaz concert in Harlem on MHD channel has me transfixed each time. I watch all of it anytime its on. When i was in Kenya, I really enjoyed K24, and in happier times, couldn’t help but watch ‘Cobra Squad’ – I still want a t-shirt from that show. Habib Koite’s Afriki it is probably one of my favourite CD’s from 2007. Don’t be fooled by the album cover a friend looked at it and worriedly asked “Is she a 3 year old?” nope. Her music was described in last month’s wired mag as “…feisty, airy crowd pleaser of Jazzy electro-pop”. I just think her sound is cool. Before i head upcountry and not have much in the way of internet access here are a few observations. In as much as the country is in the grip of elections with incendiary sms from phone to phone; and tribal tensions appear to be escalating, I noticed that there are messages promoting peace and unity during the elections; in likely places – church, and unlikely, sms messages confirming that a recharge of airtime is successful. Church – Attended a service where the pastor called for one person from different parts of the country (rift-valley, coast, north eastern, western etc) to come to the front of the church. He also called for people from other parts of Africa and the rest of the world to join in. A lady from the netherlands was present i think… They held hands as he prayed for the country, reminding everyone that even after the elections, we will live together in peace. The electoral commission of Kenya has done a good job of running ads promoting voter turnout. other organizatons such as Eric wainaina’s Umoja Pamoja also run ads appealing to young people to vote for young MP’s and progressive leaders. There are huge billboards everywhere you look, the most numerous being those of President Kibaki in a nice suit, blue background and the words “Kazi iendelee” I have seen a couple ‘Adopt a light’s with ads for Kalonzo. Paper posters are pasted on electricity poles, telephone poles, kiosk doors and even trees. Some have been ripped off and new posters placed, it does not look good 🙁 There is a general feeling of disorganization, which can be felt from the moment you get off the plane. (see Josiah Mugambi’s post, KP’s woes with luggage, and Shashank’s post on parking) things just seem off. Its disconcerting because in June when I was here…I loved how efficiently the luggage was handled, and the CBD was just nice. Once this election is over i hope Nairobi can revert back to the beautiful city it was. NTV has been posting clips from the news, so for diaspora kenyans wanting to stay in the loop, do check it out. Uploading a video is a tortourous task, so i wont even try. Happened to watch the new TV channel K24 ‘All Kenyan All the Time’. I liked it alot, the styling for the intro shows Kenyan people in different areas, usual day to day task such as a woman washing clothes, a woman on a boda boda etc. It appears its focus will be on local content (writing this offline so cant check for more info, GIYF though). Jeff Koinange interviewed the Director of Kenya Wildlife Service, Kipngetich about the work he does. Excellent, engaging and more so, quite pertinent. The talked abit about the Amboseli ownership drama, which i have to dig for more info on..there is some ownership dispute i think Director Kipngetich laid out the strategy for KWS; it included focus on people and Ecology. Kipngetich is an impressive guy, and just from talking to a diverse cross section of Kenyans, most of them agree that he is doing an excellent job at KWS – He will probably help KWS reposition itself in a manner that will maximize the tourism dollars and increase growth in that industry. Thank you for reading my blog – I wish you and yours a wonderful holiday season, a stupendous year ahead and…wimax. Santa you hear that?! 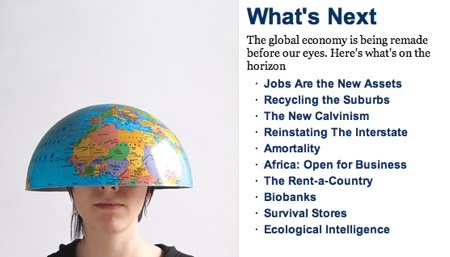 I came across this solar powered LED lamp via worldchanging author, product designer Jeremy Faludi. It definitely has an interesting design…wondering why the weird shape? Pictures from his site speak louder than words. First, 3 words “Usable form factor”. Would be interested in your thoughts on this product. Would you use it? Do you like the design? Is it practical? What follows are some tangentially related thoughts, just so I am clear, I am not attributing what follows below to the above product. 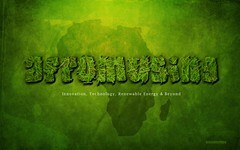 Just thinking through the idea of design ‘for Africa’. 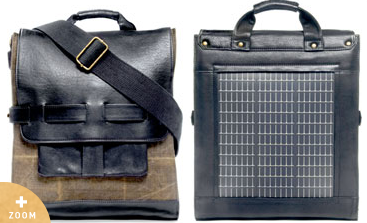 One of the things that came up during a spirited discussion of the solar powered computer and the OLPC laptop many moons ago, was the question of relevant products, and whether these products that are labeled ‘for Africa’ smack of designing down. Maitha asked (in swahili) Don’t Africans deserve products made of high quality – in reference to the OLPC that is currently available for purchase. Granted at the time, maitha was looking at the bulky nature of linux for the OLPC, and the product was still being designed (with myriad challenges to overcome). I have not gotten my hands on and XO but when i do, i would like to revisit some of the issues raised. Particularly (perhaps i am simplifying, but) is the OLPC a good quality product that is relevant for African children? Atanu Dey of Deeshaa.org looked at the OLPC in context of education in India (I need to reacquaint myself with his arguments…I had been following the OLPC dev, then sorta lost track somewhere). Wired had a profile of the OLPC designer Yves Behar, which I am rereading now, I just recall that he did do some nifty things to get OLPC to be what it is today.So, please chime in with your examples of products you think smack of ‘designing down’ and those that you think are ‘just right’. These are based on positive feedback from my dear uncle who absolutely finds function and convenience in using the above products.